Shooting Star Chase Hospice has instructed Cattaneo Commercial to sublet a self-contained office suite of 4,133 sq ft in their headquarters building, Bridge House, Addlestone Road, Weybridge KT13 2UE. 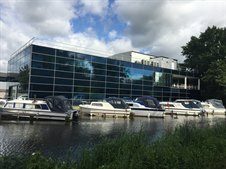 The building is situated in a tranquil setting on the banks of the Wey Navigation within a pleasant walk of the town centre and only 1.5 miles from junction 11 of the M25. The suite benefits from views over the canal and is fully air conditioned with 14 on site car spaces. Competitive rental terms are available.